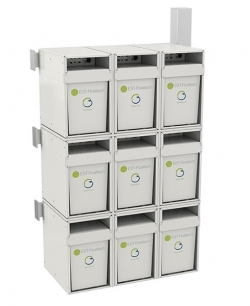 A modular battery system that offers exceptionally high energy density will be the focal point of the EST-Floattech booth at this year’s expo. The Green Orca features in a number of upcoming projects that company representatives are to discuss with visitors. One such project, in the Netherlands, is Sendo Liner, a 110 x 11.45m (360 x 4.8ft) inland barge equipped with electric motors powered by one of two onboard 435kW Volvo Penta generators, or by the 546kWh Li-ion battery pack. 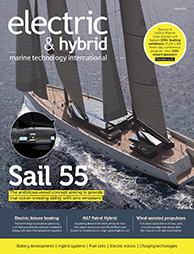 The company is also involved in RiverCell/Elektra, a project that will see heavy cargo vessels switching to electric. The Elektra is a zero-emission vessel, thanks to two 200kW electric motors. With fully charged batteries, its range is 65km (40 miles) at 8km/h (4.9mph). Longer journeys to the seaports of Hamburg and Szczecin – a day trip of 130km (80 miles) at a speed of 8.5km/h (5.3mph) – are possible using hydrogen fuel cells that are connected in parallel for a total capacity of 192kW.